The Delta Sport XC trainer from Garmin, with proven Tri-Tronics® technology, gives dog trainers more control with more simplicity. The easy-to-use, 3-button handheld controller with improved false-correction control, easy-to-read LCD display and compact dog device with changeable contact points (long and short) gives you 36 professional levels of continuous and momentary stimulation plus tone and vibration, 5 correction configurations and the ability to set the device to train 1, 2 or 3 dogs from up to ¾ mile away (with purchase of additional dog devices). Sport XC features a fully adjustable BarkLimiter with Advanced Bark Correction for more effective training in the field and a quieter kennel at home. Delta Sport XC is ergonomically-designed to require only 1 hand to operate with 3 front “action” buttons for stimulation, tone and/or vibration. Side buttons and an easy-to-read LCD let the trainer switch easily between training configurations and different dogs being trained. The slim, compact, dog device comes with interchangeable long and short contact points for all breeds and coat thicknesses and has an effective range of ¾ mile. 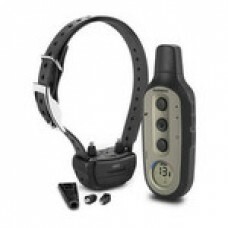 Delta Sport XC offers dog trainers the option of using continuous and momentary stimulation, vibration or tone. Or, use all 3 in 1 session. With 3 correction configurations (viewable in the LCD display), the trainer can select the training option best suited to the situation and dog temperament. Delta Sport XC offers the ability to control up to 3 dogs (with additional dog devices sold separately) and quickly change between them. Delta Sport XC features an adjustable, controllable BarkLimiter with Advanced Bark Correction. BarkLimiter recognizes the difference between wanted and unwanted barks as well as vibration from scratching and scraping or from other dogs’ barks. Thus, it virtually eliminates false and over correction. You can adjust the levels on the BarkLimiter and control it from the handheld allowing you to train even in BarkLimiter mode. Like all Garmin outdoor products, Delta Sport XC is designed to be effective, rugged and water-resistant (IPX7) with a long lasting rechargeable, lithium-ion battery in both the transmitter and dog device. Personalize your Delta Sport XC dog device by purchasing one of our polyurethane-coated accessory collars (multiple colors available, purchased separately). Or add even more style with a 3/4-inch woven nylon Lupine Collar (multiple versions available, purchased separately).